GARDAÍ HAVE APOLOGISED to a young woman who was accused of being the mother of a baby boy found stabbed to death on a beach in Kerry 34 years ago. At a press conference in Cahersiveen, Co Kerry this afternoon, gardaí confirmed that a formal apology has been offered to Joanne Hayes for the stress and pain she was put through as a result of the original investigation into the Kerry Babies case in 1984. They also confirmed that forensic evidence has proved that Joanne Hayes was not the mother of the child. Gardaí have now begun a review into the death of the baby boy, who became known as Baby John, in a bid to identify him and find out exactly what happened to him. “After all these years, Baby John deserves the truth,” Superintendent Flor Murphy said. Gardaí have appealed to anyone who was living in the area in early 1984 to come forward with any information, no matter how small. 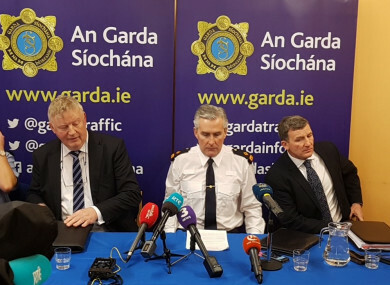 A viable DNA profile has been obtained from samples taken from the baby in the course of the original investigation, and an incident room has been established in Cahersiveen Garda Station. Superintendent Murphy said it was “accepted that the original investigation fell short of what was required and expected of a professional police service, but I want to reassure the public that this will be a thorough and professional investigation”. The Kerry Babies case became seared into the national consciousness, highlighting Ireland’s attitudes towards women, family and religion in 1980s Ireland. Joanne Hayes, who was 25 at the time and had been known to have been pregnant, was arrested by gardaí soon after the discovery of Baby John in April 1984. She and her family initially confessed to the baby’s murder but later withdrew the confessions, which they said were produced by coercion from gardaí, and said that Joanne had given birth to her baby at the family farm. Joanne’s baby had died shortly after it was born and was buried on the farm. After the charge of murder against Joanne Hayes was thrown out of court, the Kerry Babies Tribunal was set up to investigate the behaviour of the gardaí during the case. The Tribunal has been strongly criticised for the way in which it handled the case, from not fairly examining the evidence to the way in which witnesses were questioned. Superintendent Murphy said that gardaí have been in close contact with Joanne Hayes through a Family Liaison Officer since the DNA sample confirmed conclusively that she was not the mother of Baby John. “The Acting Garda Commissioner has written to and spoken to Ms Hayes to formally apologise to her on behalf of An Garda Síochána, and I will now restate that apology,” he said. “It is a matter of significant regret for An Garda Síochána that it has taken such a long time for it to be confirmed that Ms Hayes is not the mother of Baby John,” he said. Email “After 34 years, gardaí have apologised to Joanne Hayes over the Kerry Babies case”. Feedback on “After 34 years, gardaí have apologised to Joanne Hayes over the Kerry Babies case”.